Service bulletin - there is a clunk or rattle from the front of the vehicle or under the dash while going over a bump or turning. at least one self-locking nut at the top of the front damper/spring assembly is loose. The rear cylinder head cover gasket leaks oil. Techline summary article - do you have a vehicle in your shop for any or all of these issues? ¿ the b5 (7.5 a) fuse in the under-dash fuse/relay box is blown. ¿ the engine cranks, but it won¿t start. ¿ the engine starts, then it stops. Dealer message - honda is collecting a healthy front brake assembly from affected vehicles that meet certain qualifications. Dealer message - ahm is investigating certain 2015-2016 accords with a customer complaint of front suspension noise. please contact ahm with information if an eligible vehicle is found. Ahm is investigating customer complaint of noises (popping, squeaking, clunking, or creaking) from the front suspension. please contact ahm prior to any repair attempts. Dealer message - ahm is investigating customer complaint of front suspension noise (popping, squeaking, clunking, or creaking). prior to attempting a repair of any kind, please contact ahm so an inspection can be scheduled. Dealer message - if a customer complains of front suspension noise, please contact ahm to schedule an inspection prior to performing any repairs. Dealer message - ahm is investigating certain vehicles with a customer complaint of front suspension noise, such as popping squeaking, clunking, or creaking. please contact ahm for inspection prior to attempting a repair of any kind. Service bulletin - the starter grinds or spins at startup. the clearance between the starter motor gear and the torque converter ring gear is not optimal. Service bulletin - this bulletin is replaced by 17-017, 2013¿17 accord: judder from the torque converter lock-up clutch all vehicles affected by this bulletin were superseded to 17-017. Service news article - planning on using a leak check dye to help find a leak? here¿s the current list of vehicles that you shouldn¿t use dye on. Service bulletin - the remote control engine starter key fob panic feature is not working. also, all four doors unlock when pushing the unlock button once instead of unlocking the driver's door only. Service bulletin - the actual fuel pump pressure is too high for the current pgm-fi software. update the pgm-fi software. Service bulletin - the starter grinds at startup due to inadequate clearance between the starter motor gear and the torque converter ring gear. Service bulletin - the mil comes on with dtc p100c (electric vtc motor speed signal circuit malfunction) and p0010 (vtc malfunction). update the pgm-fi software to correct this issue. Service bulletin - the battery sensor may experience an internal failure, resulting in dtc p154a. Charging system indicator is on with dtc p154a the charging system indicator is on with dtc p154a (battery sensor internal failure). the battery sensor has an internal failure. replace the battery sensor. Tech line summary article - do you have a vehicle in your shop for any or all of these issues? ? the b5 (7.5 a) fuse in the under-dash fuse/relay box is blown. ? the engine cranks, but it won?t start. ? the engine starts, then it stops. A rubbing or groaning is heard from the driver¿s front airbag module while turning the steering wheel. Techline summary article - does the rear window glass look distorted or blurry, especially when viewed through the rearview mirror? we¿re currently reviewing this issue and are looking for a solution. Service bulletin - there is a noticeable wind noise at ear level from either the driver¿s or the front passenger¿s window. the wind noise is caused by a gap between the run channel and inner sash. Service bulletin - there is a noticeable wind noise at ear level from either the driver¿s or the front passenger¿s window caused by a gap between the run channel and inner sash. Service bulletin - dtc p2422 may appear when dirt clogs the evap canister vent tube. 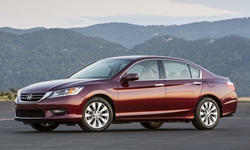 2014-15 honda accord hybrid: vehicle may switch to a fail-safe ev mode due to cell voltage sensor incorrectly interpreting electrical noises from the inverter and motor circuits as a problem.